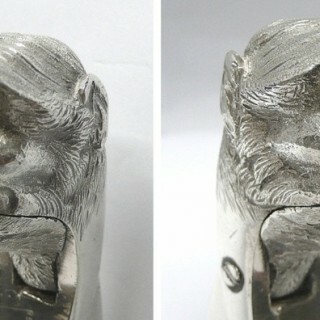 An unusual antique silver plated nutcracker with a finely modelled head of a monkey at the top. 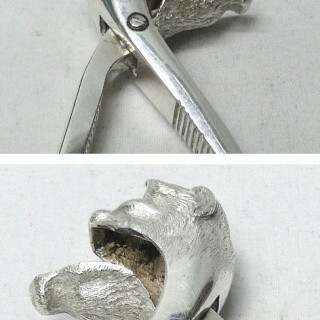 To use – simply place the nut inside the monkey’s jaw and squeeze the handgrip. 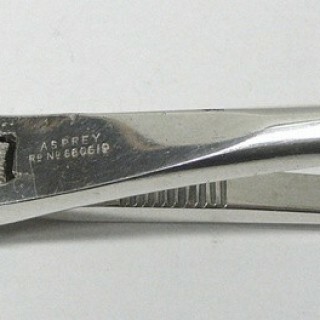 Stamped Asprey, registered design number 680619. English, circa 1910. Biography – Asprey was founded in 1781 as a silk printing business in Mitcham, South London by William Asprey, the descendant of French Huguenots who fled to England to escape religious persecution. William’s son Charles and his grandson, also Charles, expanded the business into the metallic arts and in 1847 the family moved into 167 New Bond Street, the premises Asprey occupies today. Asprey made superlative traditional dressing cases and they also created new, more portable designs, especially in leather, suitable for the new style of railway travel. The company continued to expand, winning medals at International Exhibitions, and was granted Royal Warrants by Queen Victoria and the Prince of Wales – later to be crowned Edward VII. Patronage came not just from the British royal family and aristocracy but foreign royalty and dignitaries who would visit the store while in London. During the 20th century Asprey grew considerably as the company acquired new manufacturing facilities and hired the finest silversmiths, goldsmiths, jewelers and watchmakers. 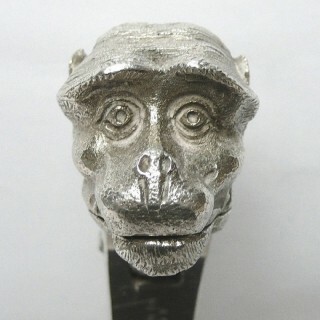 Asprey employed the finest craftsmen, including Ernest Betjeman, the father of the distinguished poet John Betjeman, and one of the most highly regarded designers of his day. In the glamorous 1920s, commissions poured in from around the world. From American millionaires such as J. Pierpont Morgan to potentates such as the Maharajah of Patiala who commissioned a huge teak travelling trunk for each of his wives. Each blue velvet-lined trunk was fitted with solid silver washing and bathing utensils with waterspouts of ornate tiger head. Asprey cigarette cases became collectable amongst young sophisticates who delighted in its modern products, from art deco accessories to travel clocks, safety razors and automatic pencil sharpeners. The coronation of Elizabeth II in 1953 occasioned the Asprey Coronation Year Gold Collection which featured an 18 carat gold dessert, coffee and liqueur service weighing almost 27 pounds. This remarkable collection went on show in the Bond Street store in April of 1953 and subsequently toured the United States. The firm continues to produce exceptional jewelry created with the finest gems by skilled craftsmen in their signature British style. Asprey have designed and manufactured sporting trophies, including the Race To Dubai trophy and the Dubai World Championship (DWC) trophy. 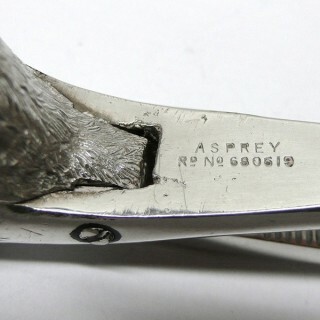 In addition, Asprey is responsible for crafting the ICC cricket trophies, Wimbledon championship runner-up and winner’s salvers as well as the FA cup trophy and medals. 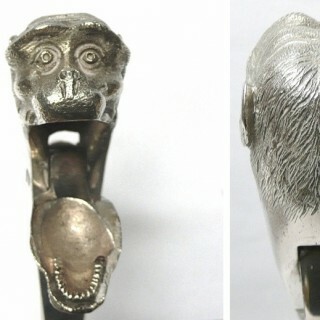 This useful nut cracker is in very good condition with no damage or restoration. Please note that this item is not new and will show moderate signs of wear commensurate with age. Reflections in the photograph may detract from the true representation of this item.